The latest trio of modernized GLONASS satellites (GLONASS-M) have begun transmitting healthy navigation messages, bringing the total of operational satellites to 17 — a milestone for the Russian GNSS constellation. The third GLONASS-M space vehicle (SV) — SVN 726 launched September 25 began transmitting a healthy navigation message on November 13, giving the rebuilt GLONASS constellation the highest number in more than a decade. GLONASS SVN 110 (724) began transmitting on October 26, and SVN 111 (725), on November 5, according to the Russian Space Agency (Roscosmos) GLONASS Information-Analytical Center. Although GLONASS had a full constellation of 21 operational satellites in 1996, by the beginning of 1998 only 16 SVs were still transmitting as the system went without launches for three years after December 1995. The short lifespan of the first-generation satellites coupled with the economic decline that followed the collapse of the Soviet Union made the long-term prospects of the world’s second GNSS appear very doubtful. 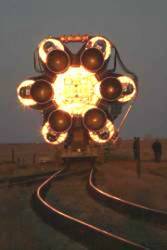 Triple-SV launches in 1998 and 2000 could not stem the dwindling constellation and by the end of 2001 only seven spacecraft operating on orbit. A decision earlier that year by then-President Vladimir Putin began a program to rebuild and modernize GLONASS. Another triple GLONASS launch is scheduled for December 25 this year. From December 18, GLONASS will help pilots to land aircraft at Koltsovo airport, Ekaterinburg. According to an ITAR-TASS news agency report on the Roscosmos website, the airport will initiate a new procedure for landing aircraft equipped with GLONASS/GPS receivers — the third airport in Russia (after Domodedovo and Kurumoch) ordered by the Russian Civil Aviation Agency to fulfil this requirement. Meanwhile, M2M Telematica recently received a “Quality and Safety Assurance” award in Russia’s National Security – 2008 contest for designing the first dog collar with embedded GLONASS sensor, according to the Russian company. Mounted in the collar, the tracking device navigation module includes a triple-axis accelerometers and wireless data link to report the animal’s real-time location via a GSM network. When the dog is not moving, the device goes into stand-by mode automatically as a power-saving technique.